3426 Adidas Team Transport is a Soccer / Football set released in 2002. 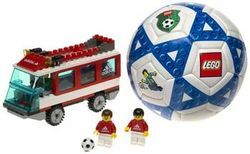 It includes a soccer ball and team bus with six minifigures. Facts about "3426 Team Transport"